Sometimes we all want to hear a story about humanity that reminds us that there are good people out there. I have two for you today. Hopefully it helps to make the world feel kinder, especially with all the crap on social media today between the Presidential candidates, Syria, and oh I could go on. This story is about a woman who quickly got on an American Airlines flight (with her 3 month old baby) to see her mom, who had a stroke and was told by nurses she might not wake up. After sitting on the plane, they were told that due to maintenance, the flight was cancelled. The woman on the plane next to her heard her talking and crying to her husband, and told her she was not going to leave her until she was on a plane to Orlando to see her mom. After finally figuring out that Southwest had a $400 flight to Orlando, the woman who would not leave her was adamant that she was going to pay for the flight — that it was her Thanksgiving and Christmas gift to her. Wow. A perfect stranger. The woman was able to get on the flight and see her mom that night. The Southwest agent also sent her an email checking in on her and giving her the contact information of the woman who purchased the ticket. So amazing — it warms my heart to know that there are people in this world that are so kind and so generous. Read the full story here. My next “wow” moment this week was reading about an anonymous donor paying $106,000 in layaways at 2 Ohio Walmart stores. The article states: “Items on layaway included toys, 70-inch televisions and even a pair of socks.” I did not know that stores still offered layaway, but it makes it so that someone can dote on others in a big or small way, much like someone might pay for the car behind them in a drive thru Starbucks. People really are kind. They really do care. Whether you end up meeting the person that is generous or whether it remains anonymous, it brings all the goodness front and center to the muck that sometimes permeates the news and social media. Pay it forward. A new Black Friday… on a Wednesday! I am not a big holiday person. If I were to pick one that is higher on the list, it would be Thanksgiving. Gratitude, family and friends, and good food. What is not to like? What I am not a fan of is the day after Thanksgiving. Black Friday. You can tell from this past Black Friday blog post. I would rather do almost anything than go shopping on Black Friday. There is not a deal that is that amazing to make it worth it to me. So when I heard that Amazon is creating their own version of Black Friday on July 15, called: Prime Day. I thought, hmm. Part of me thinks the idea is brilliant, the other part hates the idea. Why not create a shopping day that is catered to the customers that shop the most with you? Almost like a customer appreciation day for those that are the most loyal — Prime members. Amazon states that there will be more sales than they have on Black Friday. Since Prime Day is meant to be a celebration of their 20th anniversary, I wonder if it is successful if they will bring it back in future years. If it becomes bigger than Black Friday, what will other retailers do to outrun Amazon? They are also offering a free 30-day membership to Amazon Prime for those that want to take part in the day. How many will keep their membership after the 30 days, and how many will drop their membership? It starts right at midnight, so be sure to take a nap, so you can be wide-eyed and ready for a day of deals. Not sure if I will partake, but Happy Early Birthday, Amazon. Holiday traditions. I am a bit of a Scrooge. My sister and dad were always so much more into the holidays, and somehow that gene did not find its way into my veins. Call me crazy, or extremely practical, but oftentimes the holidays are just another day in the grand scheme of things. I appreciate them as a day to relax, recharge, and be slow. So, having said all that what’s your favorite holiday tradition? We both love to sleep in (who does not whenever possible). Maybe it is because we do not have kids yet, but we do not really have many/any holiday traditions. The one thing we often do is make my mom’s coffee cake. I like it, Chris likes it, and it is easy to make. 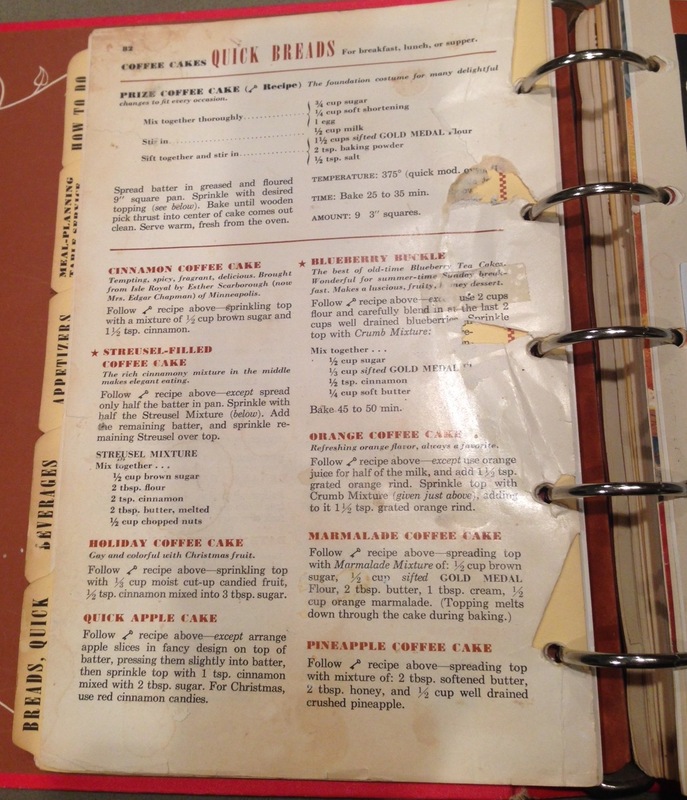 It is nothing fancy, just a Betty Crocker (Picture Cookbook circa 1950) recipe that I doctor and adapt to my own liking, but something about it reminds me of my childhood. Somehow my family (and often my grandma) split a 9 x 9 pan of coffee cake (how did we ever do that!)? We would get up on Thanksgiving or Christmas morning and have it right away (before presents or anything). I have my mother’s Betty Crocker cookbook copy. The hole punched page has ripped out and the page itself is worn and splotched. Spread batter in greased and floured 9″ pan. Sprinkle with desired topping. Bake until wooden pick thrust into center of cake comes out clean. Serve warm, fresh from oven. Baker note: I go on instinct for the amount of brown sugar, butter, and cinnamon I put together. I sprinkle it on top of the batter and then cut tiny sized chunks of unsalted butter and place them randomly all over the top of the streusel. It makes for more of a crunchy, yummy topping. It is my adaptation. Also, I use the above topping, there are other options for toppings in the cookbook. Recipe note: Be sure that your “wooden pick thrust into center of cake comes clean” (who uses the word thrust)? What are your holiday favorites or traditions? One of my least favorite days of the year is Black Friday. I abhor shopping on that day. This year there is an art bazaar that I would like to go to in order to support local artists. If I happen to be in downtown Portland, our local boutiques and small businesses participate in Little Boxes, a way for the community to support local businesses. That would be the only adventure I would have with shopping. Even having said that, I still do not have any interest. I do not understand the desire for stores to be open (and for folks to be out shopping) on Thanksgiving Day. Why oh why? Our nearby outlet mall will be open from 6 pm to midnight on Thursday, November 27, and then is open from midnight to 10 pm on Friday, November 28. Which basically means they will be open from 6 pm on Thursday to 10 pm on Friday. WHY? This is why I loved hearing about “RAK Friday” (Random Act of Kindness Friday) intended for Black Friday. Friends started a Facebook page and also has their three kids in on the action. What a wonderful idea to think about celebrating Thanksgiving as a day of gratitude and rolling into Black Friday doing things for others, instead of buying “things.” What if we were able to change Black Friday into RAK Friday? What a difference it would make in this world of consumerism and commercial spending. So here is my question for you, what should I do on RAK Friday here in Portland? And, for those of you that might be reading this while waiting in line at the mall, what RAK are you going to do for someone today?